If you’re like most recruiters, the best part of your job is those moments when you truly connect with a top candidate and get a “yes” for your open role. Most likely, you are not as thrilled by the back-and-forth it takes to schedule those moments. 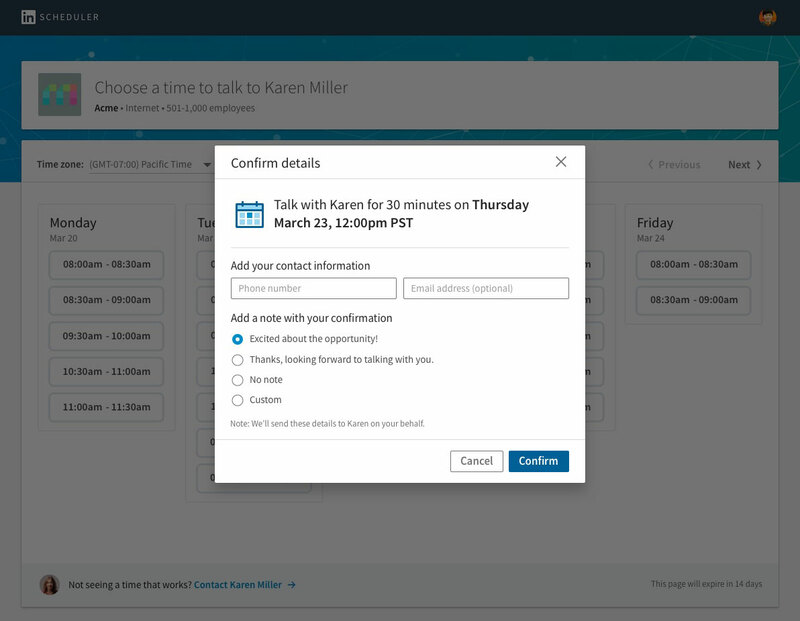 To help alleviate this pain point, we are introducing LinkedIn Scheduler, the latest InMail feature for LinkedIn Recruiter that will allow you to easily schedule interviews. Our goal is to help you spend less time on the back-and-forth—and a lot more time delighting, advising, and helping candidates make the decision to join your company. 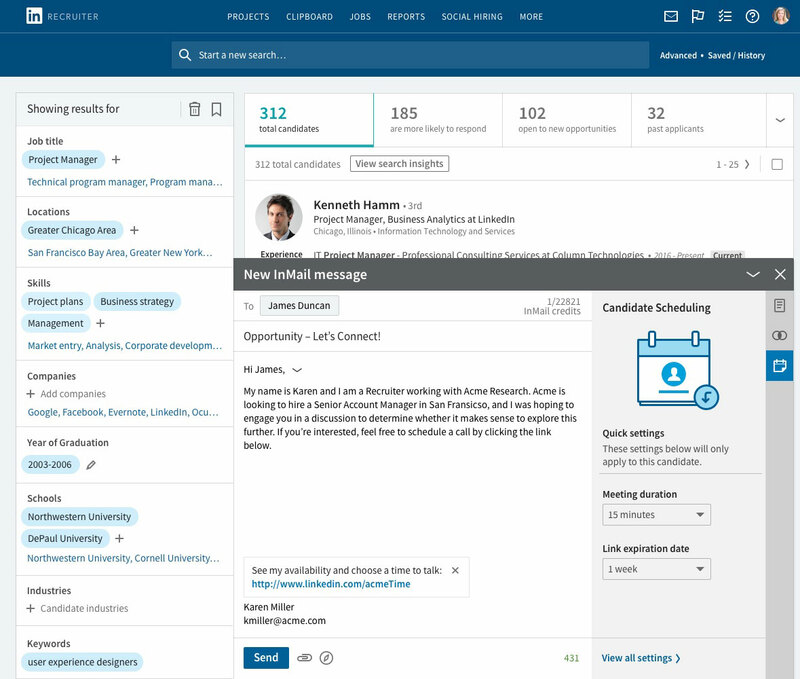 Through a new InMail message, you can now let candidates reserve a time that works for them based on your calendar availability—all without leaving LinkedIn. 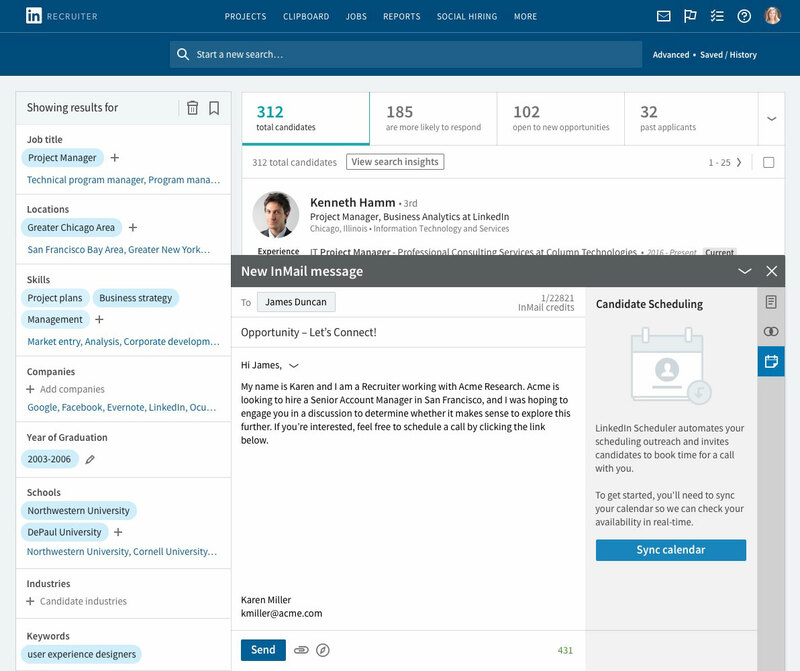 You sync your calendar so LinkedIn Recruiter has a real-time view of your availability (Google and Office 365 calendars only, with more coming soon). 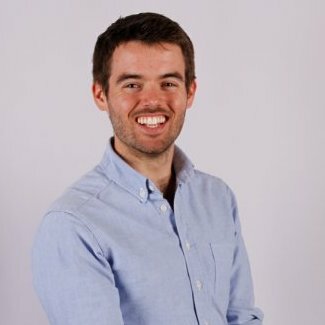 You set your scheduling preferences: how long you want candidate meetings to last (15 min, 30 min, etc.) and how long you’d like to share your availability. You add a calendar availability link to your InMail outreach —whether you send InMails to candidates one-by-one or en masse. It’s that simple. Candidates can quickly pick an available time to connect with you for their initial interview. Candidates then simply enter their contact information, and the details are automatically synced back to your calendar. Imagine sending a dozen InMails before lunch, grabbing a bite, and coming back to see your calendar is suddenly full of candidate calls for the next week, without you lifting a finger. That’s the power of LinkedIn Scheduler. Not only are you saving a ton of time—you’re also screening candidates sooner (i.e., before the competition), creating a delightful (and mobile-friendly) candidate experience, and freeing yourself up to focus on the best part of your job: really connecting with talent. 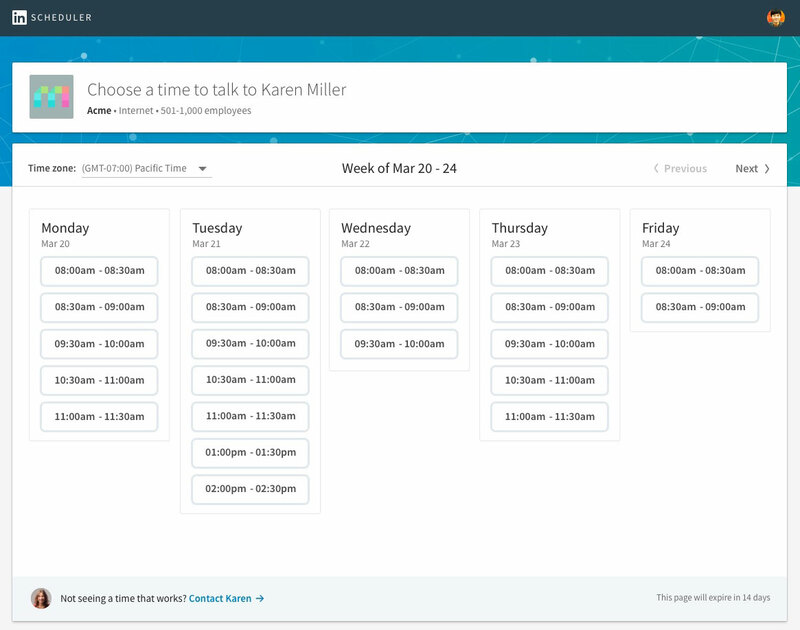 LinkedIn Scheduler is just the latest way that we’re working to make recruiters more productive, powerful, and personal. Check out the LinkedIn Scheduler video and stay tuned for more LinkedIn Recruiter product updates as we continue to strive to support the recruiting community.